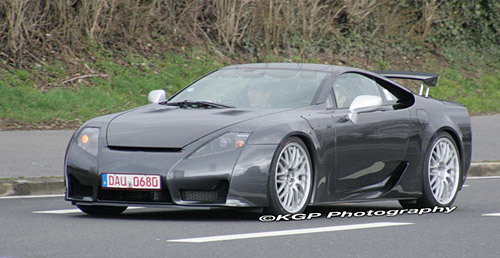 Does the Nissan GTR have anything to do with the Lexus LF-A delay? Maybe it’s just the way Toyota’s testing is scheduled (according to our spies at the ‘Ring, the LF-A has resurfaced and should be on track shortly). But I wonder. Has the GT-R got Toyota running scared? Toyota’s problem is this: The GT-R has set the performance bar incredibly high for the next Japanese supercar. And Toyota being Toyota, delivering a supercar that’s second-best to a Nissan is unthinkable, especially if it’s going to carry the Lexus badge. The LF-A has to be faster than the GT-R, in a straight line, and around the legendary Nordschliefe. Otherwise it risks being perceived a failure. I think it’s safe to say that it’s just the way Toyota’s testing is scheduled, though there is merit in the idea. I wouldn’t limit it to just Lexus though, the GTR has to have every supercar manufacturer a little nervous.